Update: A Groupon Malaysia executive has provided a statement following our request yesterday. We’ve appended the statement below. Apple’s latest iPhone 5c and 5s was only announced two weeks ago, and was recently available in select countries worldwide last Friday, including our neighbours Singapore. With no word on availability here in Malaysia just yet, it looks like Groupon Malaysia has secured quite a coup, with its latest deal offering the iPhone 5c. The listing went live about an hour ago, and Groupon has priced the deal at RM2199 for the 16GB variant of the device. Now, to date, there is no official word on what the official RRP will be for the iPhone 5c when it arrives here, but it is worth noting that RM2199 is the original retail price for last year’s iPhone 5. In comparison, the iPhone 5s is priced the same as the iPhone 5 in the US; indeed, flagship iPhones have not fluctuated away from the $649 price tag for the last few iterations. Further, the 5c’s retail price is set at $549 – a full $100 lower than the 5s. What’s also interesting to note is in the warranty of the iPhone 5c in the Groupon listing, which states that every iPhone 5c purchased via this deal is covered by a “1-year warranty for manufacturing defects by Groupon Malaysia”. In contrast, the company’s recent listing for the Samsung Galaxy Note 3 comes with a one-year official warranty by Samsung Malaysia Electronics. In addition, the listing also promises free delivery within 10 working days from the date of purchase. Both of these suggests that the units sold here may be parallel import units brought in from another country, and not from Apple Malaysia or other official channels. “We have sourced this merchant which is licensed by Apple International to feature the iPhone 5c on the Groupon Malaysia deal site. As Groupon Malaysia aims to continuously bring amazing life experience to our customers, this is one of the many exciting deals on our website to enable customers to enjoy the hottest items in the market ahead of time. 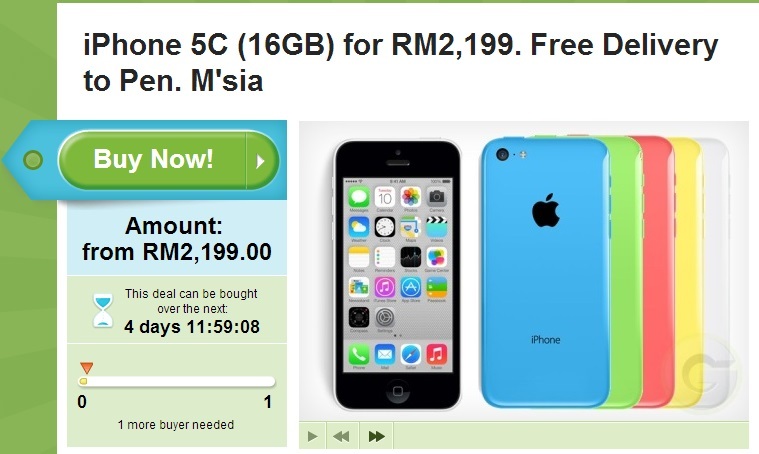 The retail price for the iPhone 5c is set at RM2,199 by Groupon Malaysia, however the official recommended retail price of the device will be announced by Apple’s official Malaysian distributors at the appropriate time. There is, unfortunately, no information regarding where these units are sourced from. Hence, even if warranty is provided by Groupon the warranty period, if a user claims the warranty for repairs, it has to go through wherever the product is sourced from – and that could lead to significant delays. At least it isn’t as bad as Lazada’s iPhone 5c and 5s offerings – not that it says much.